This sports boat will allow you to navigate through the problems and, often, through whatever sea conditions you encounter. 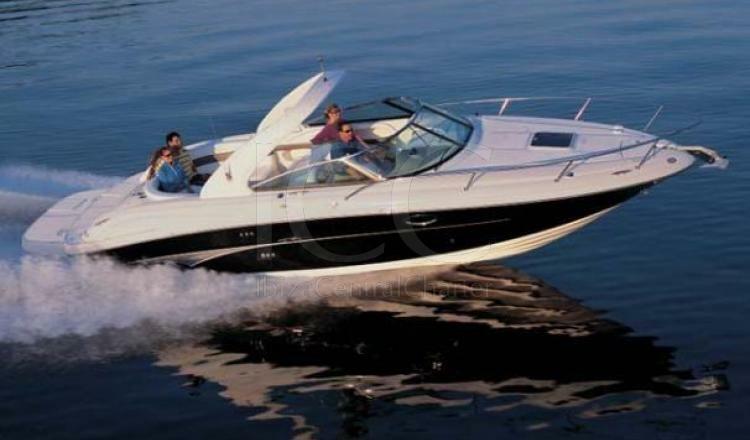 The Sea Ray 290 SS is one of the most popular Sea Ray boats in its category. It measures 10 meters long and 3 meters wide and has a 400hp engine that will allow you to reach the neighboring island of Formentera in a fast way. The motorboat has a modern and very spacious design, giving capacity to comfortably navigate a group of up to 12 people. Inside it has a cabin with a small kitchen next to a living room with a V-shaped armchair and folding table ideal to enjoy a lunch or dinner with your friends or family. In addition, the armchair is convertible into a double bed, allowing passengers to rest and recharge their batteries to continue the incredible experience in the turquoise waters of the Mediterranean Sea. We will also find in the interior a bathroom that will provide us with the necessary privacy for a day of charter. 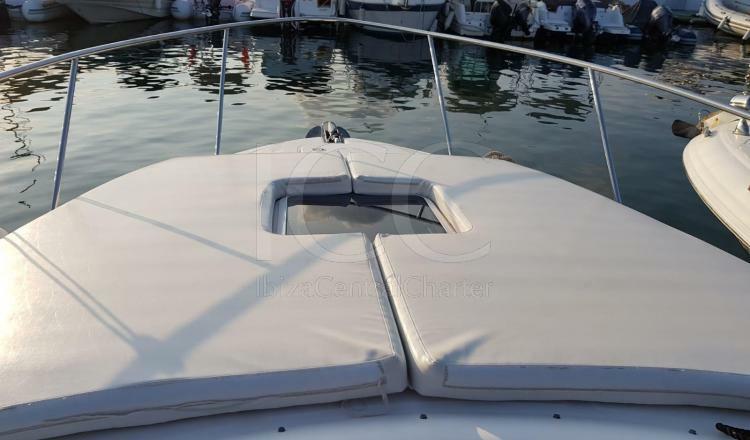 Outside we have comfortable seats in the command area to ensure the comfort of the skipper in navigation and an aft sofa so that the rest of passengers can comfortably enjoy the sea breeze while sailing. The sofa comes with a table to enjoy an outdoor snack. It has a large solarium ideal to relax, rest and regain strength while tanning the skin. As well as a bathing platform with a ladder that will facilitate access to water. 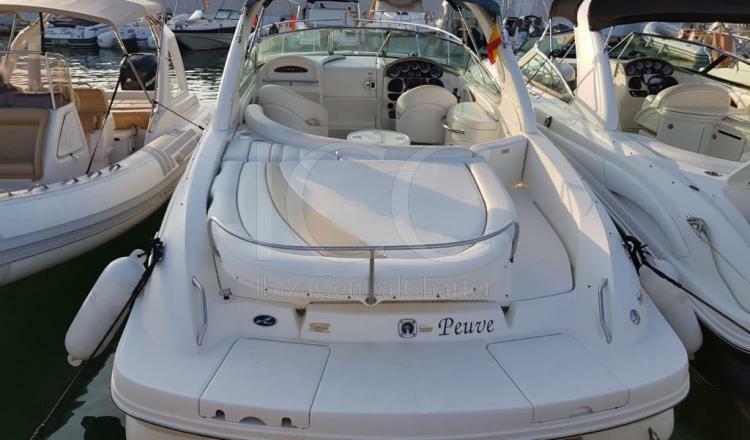 Undoubtedly, this sports boat will allow you to navigate smoothly and comfortably through any sea condition you encounter. 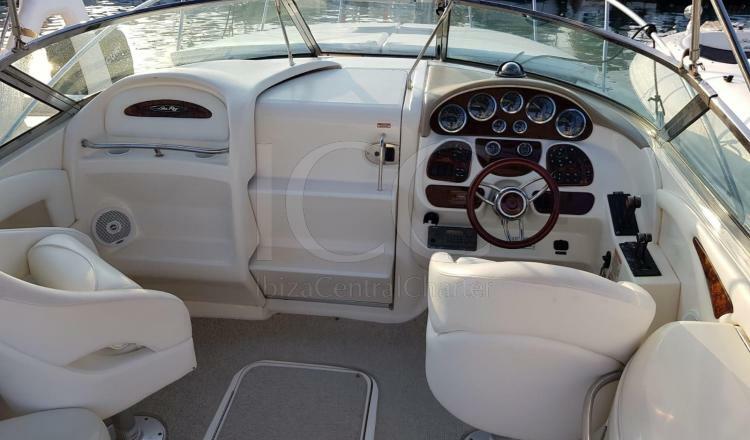 - Mooring in Marina Ibiza. - Fuel: 85L / h.
- Employer: € 150 / day. Deposit: € 1000 in cash or credit card. The lessee, and before two months to the scheduled date of delivery of the vessel, may unilaterally withdraw from the contract without compensation and with the right to return the amounts delivered. If the cancellation occurs after two months and before the 30 days prior to the date of delivery of the vessel, the lessor will return 75% of the amount of the rent, staying with 25% in concept of the damages and losses incurred by said cancellation. If the lessee proceeds with the cancellation 30 days before boarding, he will lose all the amounts delivered to the lessor, whatever the amount. The cancellation must be made in writing. In case of impossibility to navigate by meteorological conditions (strong winds and swell) the departure date will be postponed to the next available day. If this is not possible, the amount delivered as a reservation will be returned to the tenant.